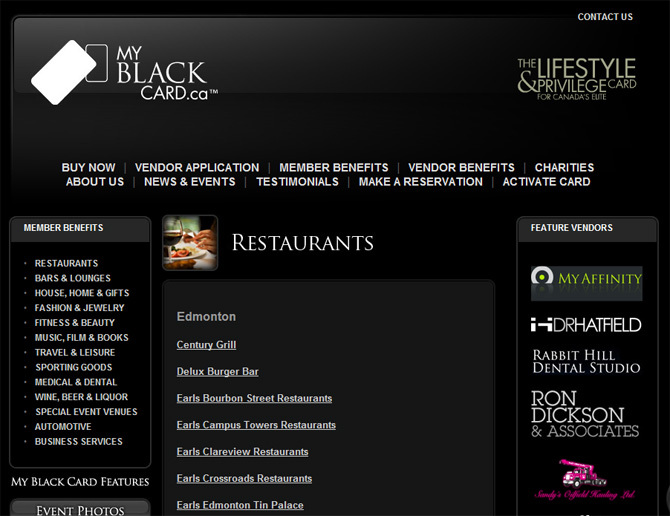 Myblackcard.ca had a good looking and functional website but expressed a frustration with waiting to have updates applied to their site. ShiftUP Consulting built a custom MS-SQL database and back-end entry system for them that allows them to add company information instantly. The left-side menu is a list of the company types they offer their members. The list is automatically filled in based on category types entered in the back-end forms and can be turned on and off at will. Underneath each of these company types is a list of companies they've entered that fit in that company type. After clicking on a company type, the middle or 'content' portion of the website displays a list of all the companies that match that company type. Finally, if you click on the company name, a list of the contact information etcetera is displayed to the user. Every piece of information is dynamically pulled from the database including the logo images for the companies. Additionally, this website is able to keep track of all of the customer data entered and customer statistics/card information are available to the owners in multiple formats.